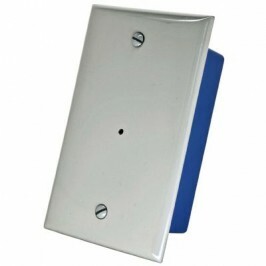 The covert electric socket cameras work great in office and other business environments such as warehouses. Thousands of us go to work everyday and pass electrical wall panels just like this and pay no attention to them. No one will suspect that this electrical socket panel actually houses a wide angle pinhole camera. The camera is a SONY CCD 480 TV Line Resolution hidden camera with a low 0.4 lux rating. That means you can see in very low light, all you need is a 20 watt light bulb in the area where the camera is set to monitor. Also the camera has a 3.7mm wide angle lens to give a 78 degree angle of view. This camera comes with a 12V power supply only. All you need is a video cable to connect this to your DVR that accepts a standard BNC video input. Hidden Electric Socket Camera 0 out of 1 5 based on ratings. user reviews. All prices are in USD. Copyright © 2013 123CCTV.com. 123 CCTV Security Cameras & Surveillance Equipment. All Rights Reserved.